Go to original pattern for design DROPS 188-28. Knitted sweater with lace pattern and raglan. Sizes S - XXXL. The piece is worked in DROPS Paris. DROPS DOUBLE POINTED NEEDLES AND CIRCULAR NEEDLE (40 and 80 cm / 16'' and 32'') SIZE 5.5 MM/US 9 – or the size needed to get 16 stitches and 20 rows stockinette stitch on 10 cm / 4'' in width and 10 cm / 4'' in height. DROPS DOUBLE POINTED NEEDLES AND CIRCULAR NEEDLE (40 and 80 cm / 16'' and 32'') SIZE 4.5 mm/US 7 for rib and garter stitch – or the size needed to get 18 stitches and 23 rows stockinette stitch on 10 cm / 4'' in width and 10 cm / 4'' in height. 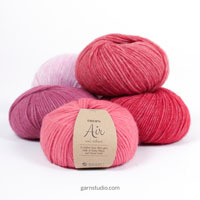 You can get the yarn to make this pattern from	19.80$. Read more. See diagram A.1. The diagram shows all the rows in the pattern seen from the right side. To work out how to decrease evenly, count the total number of stitches on the needle (e.g. 183 stitches) and divide by the number of decreases to be made (e.g. 11) = 16.6. 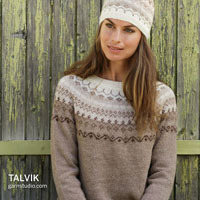 In this example, alternately knit together every 15th and 16th stitch and every 16th and 17th stitch. Start 3 stitches before the marker thread in the side: Knit 2 stitches together, knit 2 stitches (the marker thread sits in the middle of these 2 stitches), slip 1 stitch as if to knit, knit 1, pass the slipped stitch over the knitted stitch. Decrease to raglan on each side of A.1. 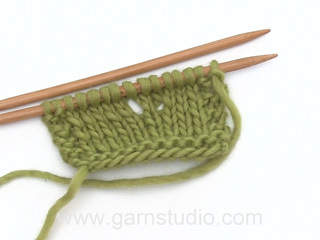 Start 2 stitches before A.1, knit 2 stitches together, work A.1, slip 1 stitch as if to knit, knit 1, pass the slipped stitch over the knitted stitch. Increase as follows mid under sleeve – start 1 stitch before the marker thread: Make 1 yarn over, knit 2 stitches (the marker thread sits in the middle of these 2 stitches), make 1 yarn over (= 2 stitches increased). On the next round, knit the yarn overs twisted to avoid holes. The sweater is worked in the round with circular needle, bottom up. The sleeves are worked in the round with double pointed needles/short circular needle. Cast on 183-200-213-225-247-264 stitches with circular needle size 4.5 mm / US 7 and Paris. Work 3 RIDGES – see description above. Change to circular needle SIZE 5.5 mm/US 9 / US 9. Knit 1 round where you decrease 11-12-13-13-15-16 stitches evenly on round – read DECREASE TIP-1 = 172-188-200-212-232-248 stitches. Insert a marker thread at the beginning of the round and a marker thread after 86-94-100-106-116-124 stitches = in the sides. Then work stockinette stitch. REMEMBER THE GAUGE! When the piece measures 7 cm / 2¾'' decrease 1 stitch on each side of the marker threads in the sides (= 4 stitches decreased) – read DECREASE TIP-1. Decrease like this every 6 cm / 2 3/8'' a total of 6 times in all sizes = 148-164-176-188-208-224 stitches. When the piece measures 39 cm / 15 1/4'' work the next round as follows: bind off the first 3-3-4-4-5-5 stitches for armhole, work the next 68-76-80-86-94-102 stitches (= front piece), bind off the next 6-6-8-8-10-10 stitches for armhole (= 3-3-4-4-5-5 stitches on each side of the marker thread), work the next 68-76-80-86-94-102 stitches (= back piece), bind off the last 3-3-4-4-5-5 stitches for armhole. Lay the piece to one side and work the sleeves. The piece is worked in the round with double pointed needles, change to short circular needle when you have enough stitches. Cast on 40-44-44-48-56-56 stitches with double pointed needles size 4.5 mm / US 7 and Paris. 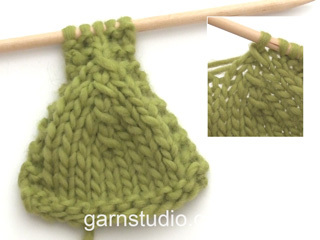 Knit 1 round, then work rib (= knit 2 / purl 2). When the piece measures 6 cm / 2 3/8'' change to double pointed needles SIZE 5.5 mm/US 9. 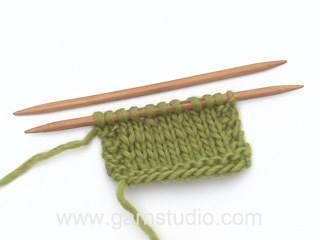 Knit 1 round where you decrease 6-6-6-8-12-12 stitches evenly on round = 34-38-38-40-44-44 stitches. Insert a marker thread at the beginning of the round (= mid under sleeve). Continue with stockinette stitch. When the piece measures 9-8-10-8-7-10 cm / 4'' increase 2 stitches mid under sleeve – read INCREASE TIP. Increase like this every 2½-2½-1½-1½-1½-1 cm / 7/8"-7/8"-½"-½"-½"-3/8'' a total of 12-13-17-17-19-20 times = 58-64-72-74-82-84 stitches. When the piece measures 41-40-39-37-36-34 cm / 16"-15 3/4"-15 1/4"-14½"-14 1/4"-13½'' (shorter measurements in larger sizes due to longer yoke) bind off the middle 6-6-8-8-10-10 stitches (= 3-3-4-4-5-5 stitches on each side of the marker thread) = 52-58-64-66-72-74 stitches. Lay the piece to one side and work 1 more sleeve. Place the sleeves on the same circular needle as the body, where the stitches were bind off for the armholes = 240-268-288-304-332-352 stitches. Insert a marker thread in each transition between body and sleeves (= 4 marker threads). The next round is worked as follows – start the round after the first 9-8-7-9-8-9 stitches on the back piece: Work * 50-60-66-68-78-84 stitches stockinette stitch, A.1 (= 15 stitches), 40-44-48-54-58-62 stitches stockinette stitch, A.1 (= 15 stitches) *, work from *-* a total of 2 times. 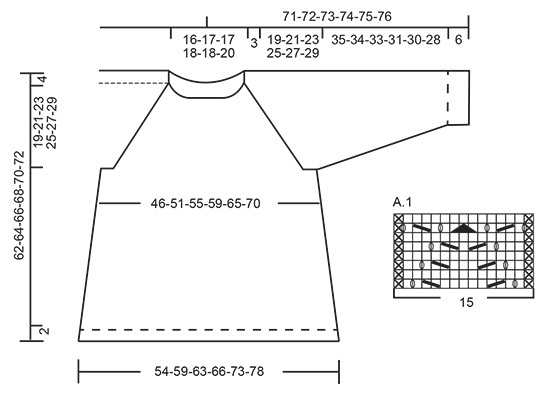 Continue this pattern and decrease to RAGLAN – see description above. Decrease like this every 2nd round a total of 19-21-23-25-27-29 times = 88-100-104-104-116-120 stitches. The yoke measures approx. 19-21-23-25-27-29 cm / 7½"-8 1/4"-9"-9 3/4"-10½"-11½''. Change to short circular needle size 4.5 mm / US 7. Work 4 ridges over all stitches, but on the first round decrease 6-15-16-13-19-18 stitches evenly on round = 82-85-88-91-97-102 stitches. 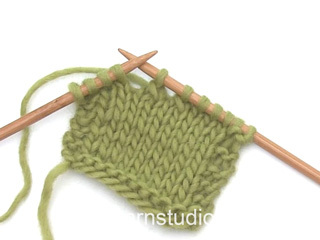 Continue until you have worked a total of 4 ridges then bind off with knit – to avoid the bind-off edge being tight, bind off with needle SIZE 5.5 mm/US 9. Hvor er det dejligt med et voksent menneske som model, mere af det. 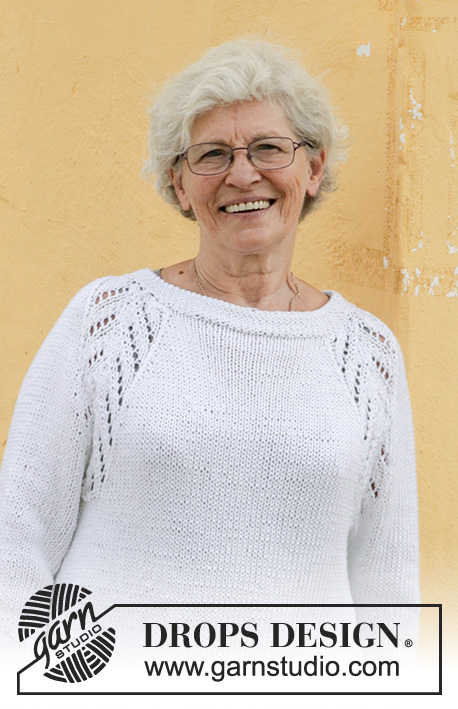 Liebe Ramona, legen Sie die Arbeit flach und messen Sie von der Anschlagskante bis zur Nadel (in der Strickrichtung) in der Mitte von Ärmel (nicht wo die Zunahmen gestrickt wurden = dh Ende/Anfang der Runde aber an der Gegenseite= Mitte oben der Ärmel ). Viel Spaß beim stricken! Hallo... Eine kleine frage hätte ich......wie wird gemesssen? Inkl.bündchen oder ab Rechte Maschen? Liebe TanjaK, unter Rumpfteil sowie unter Ärmel wird es von der Anschlagskante gemessen, dh inkl. Bündchen. Viel Spaß beim stricken! Liebe Mona, vergleichen Sie diese Maßen mit einem ähnlichen Pullover, und je nach dem Sie den Pullover etwas eng oder lieber locker möchten, entscheiden Sie für die kleinere oder die grössere Größe. Hier lesen Sie mehr über die Maßen und Grössen. Viel Spaß beim stricken! Love this pattern but don't knit in the round. Is there a 'pieced, flat' version available or a similar pattern of the same shape/style? Dear Mrs Lindsay, you will find here some notes explaining how to adjust a pattern onto straight needles, you can also browse our patterns to find a similar one worked in several parts. Happy knitting! How refreshing to see an "older" model. 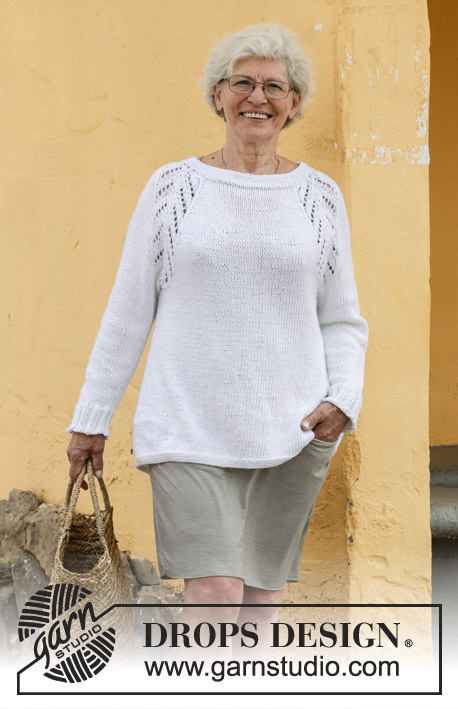 Grannies don't just wear shawls and grey cardigans. Think this will make a great transitional piece!